Five Old Testament stories come to life with these delightful, fun and easy to make press-out models. The scenes are great for children to play with or to use as a visual resource for classes. 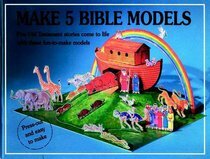 About "Make 5 Bible Models"
This collection of five Old Testament stories includes press-out models which help to tell the story.